Microdermabrasion is a skincare treatment that exfoliates the outermost layers of your skin to remove dead skin cells, open up the pores and promote the growth of new skin to leave your skin feeling softer and brighter, helping to reduce fine lines/wrinkles, blemishes and more. 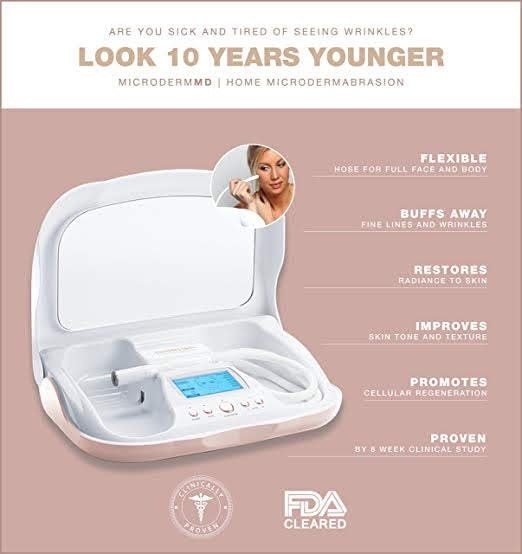 Typically, a Microdermabrasion system consists of handheld device that combines the action of directing a fine stream of tiny abrasive crystals across the skin (usually the face and neck) to loosen dead skin cells along with a vacuum pressure that works to remove the loosened dead skin. Microdermabrasion is a gentle treatment that’s typically used on the face, but can also be used on other parts of the body if required. 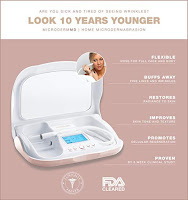 You can make an appointment with a skincare/beauty specialist to have someone perform this treatment for you or you can purchase a Microdermabrasion home treatment system to treat yourself. A home microdermabrasion system typically uses a diamond-tip wand instead of spraying a stream of crystals, making it safer and easier to treat yourself. The wand is attached to a hose which is attached to the machine and you simply lightly glide the wand over your skin - the diamond-tip exfoliates along with a vacuum suction power to remove the dead skin cells. 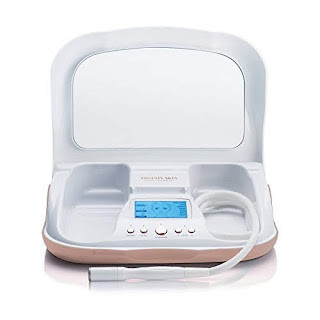 You can usually adjust the intensity of the vacuum suction power on the microdermabrasion machine and different sized tips and different grades of coarseness on tips are normally available to use on different areas of the body. N.B. It’s always advisable to consult your doctor or health care professional before undertaking any new skincare or health regime.